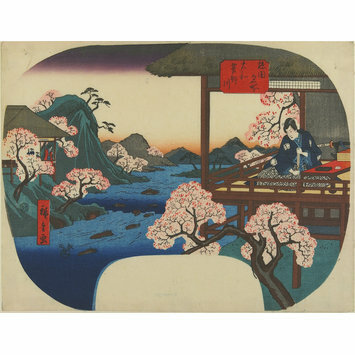 This beautiful 'uchiwa-e' (rigid fan print) design by Hiroshige depicts cherry trees in blossom. They are situated along the Yoshino River in southern Nara Prefecture. We might on first sight think that it is a landscape print, as suggested by the title in the red cartouche. 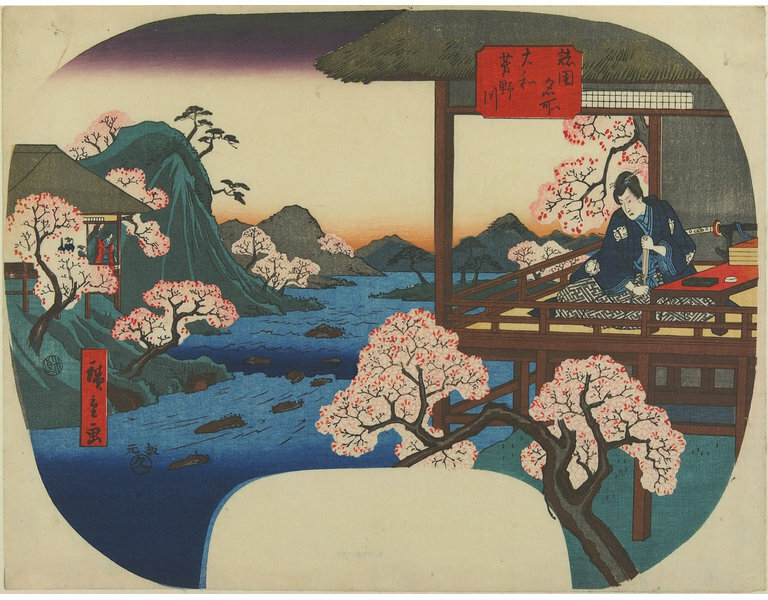 A contemporary Japanese viewer, however, would have immediately recognised it as the famous scene in the play 'Imoseyama Onna Teikin' ('An Example of Noble Womanhood'). The young lovers Koganosuke and Hinadori are deterred from meeting by the long-standing feud between their families. Here they look longingly at each other across the expanse of the Yoshino River. Tragedy ensues as they both choose death in preference to serving Soga no Iruka. He is the country's scheming senior minister, who sends orders via their parents that they should become his retainer and concubine respectively. Fan print, aiban size. Artist signature: Hiroshige ga. Publisher mark: Ibaya Kyubei. Censor seal: Mera. Height: 220 mm approx., Width: 290 mm approx.